128 pages | 11 B/W Illus. Using Self-Assessment to Improve Student Learning synthesizes research on self-assessment and translates it into actionable guidelines and principles for pre-service and in-service teachers and for school leaders, teacher educators, and researchers. Situated beyond the simple how-to frameworks currently available for teachers and graduate students, this volume illuminates self-assessment’s complexities and substantial promise to strategically move students toward self-regulated learning and internalized goals. Addressing theory, empirical evidence, and common implementation issues, the book’s developmental approach to quality self-assessment practices will help teachers, leaders, and scholars maximize their impact on student self-regulation and learning. "Every teacher wants to help students self-assess their own learning, but figuring how to do so in the context of real classrooms, with all the pressures and complications that come with them, is a significant challenge. 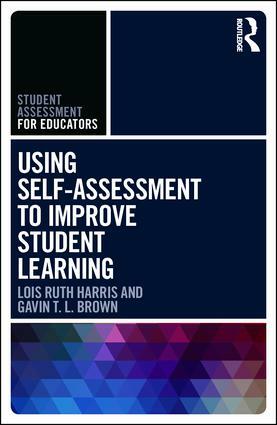 Harris and Brown's book offers a unique perspective, connecting assessment, learning, and motivation theories with practical advice. Teachers will feel encouraged and empowered after reading this clear, concise guide to implementing self-assessment." "In this well-written review of the most current data available on formative assessment and motivation, Harris and Brown remind us of the importance of involving students in their own learning. In an era where tests and testing serve as relentless messengers of students’ inherent academic value, it is more important than ever that educators teach students the skills, knowledge, and disposition necessary to become independent learners and self-assessors. This timely book should be in the hands of every educator interested in helping 21st-century students break free from the tyranny of externally imposed achievement information by facilitating lifelong reflective learners." Lois Ruth Harris is Senior Lecturer within the School of Education and the Arts at Central Queensland University and Senior Research Fellow at the Learning Sciences Institute Australia at Australian Catholic University. Gavin T. L. Brown is Professor, Associate Dean Post-Graduate, and Director of the Quantitative Data Analysis and Research Unit in the Faculty of Education and Social Work at the University of Auckland, New Zealand.